Sticker Trash Art Campaign | JONAH BRUCKER-COHEN, PH.D. Sticker Trash Art Campaign – JONAH BRUCKER-COHEN, PH.D. The Spanish artist group, Joystick‘s project “Thanks to the trash that has given me so muchÂ¨ offers another way of seeing the process of recollection of objects found in trash containers throughout the streets of the big cities. The project starts in Barcelona and creates a series of vectorial images that recall objects found on the street, with the intention of giving them a longer life. The images made are accompanied by the text Â¨thanks to the trash that has given me so muchÂ¨. “So what we do is stick them on the trash containers around the city. The process of reusing objects found on the street doesnâ€™t exist in some countries of Latin America as it does in Europe. Usually the furniture and home appliances are given to relatives or friends or taken to the people who fix them before declaring them useless. In countries with economical problems, the patching, fixing and reusing process is very common.” Interesting take on recyclying trash into useful objects and devices. 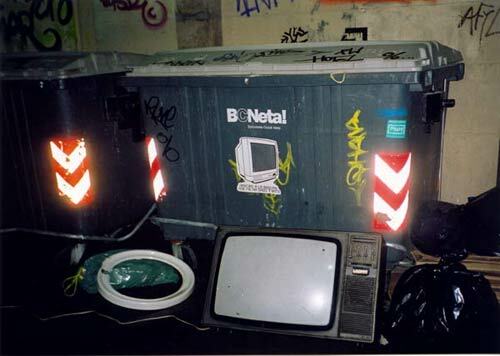 This reminds me of our “DIY Urban Challenge” workshop that we ran last summer for ISEA 2006, that attempts to recycle or re-use trash found on the streets, repurpose it with different forms of technology, and then re=install them back into the city. that is so funny! the trash that has given me so much! it makes me appreciate it, now that you put it that way…great to feature them.